These smoked pork chops are thick, bone-in chops coated in homemade BBQ spice rub and smoked at low temperature until tender and juicy. An easy and unique dinner option that’s packed with flavor! Whenever I go to restaurants, if a pork chop is on the menu, I have to order it. Especially if it’s a smoked pork chop! These homemade smoked chops are as good as the restaurant version, serve them with loaded corn casserole and parmesan roasted broccoli for an unforgettable meal. In my opinion, pork chops are an underutilized cut of meat. They’re inexpensive, full of flavor and can be dressed up in so many different ways. These smoked pork chops are one of my favorite ways to use my smoker – they’re relatively quick cooking yet totally satisfying. How do you make smoked pork chops? The first step is to prepare a brine. 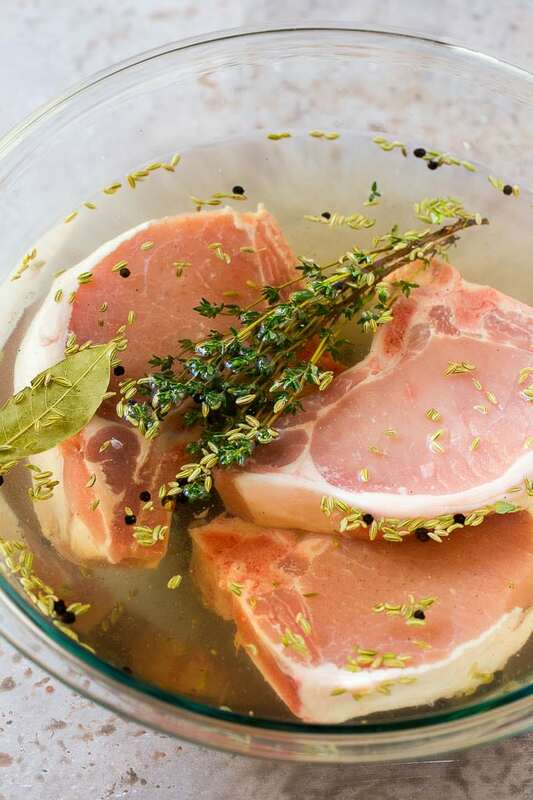 You’re probably wondering, why would you need to brine pork chops? Pork is a naturally lean meat, and the brine both infuses the meat with flavor, and also helps to prevent the pork from drying out in the smoker. The brine is a mixture of salt, sugar, herbs and spices. The pork chops are then coated in homemade BBQ spice rub, before they get seared and head off to the smoker. 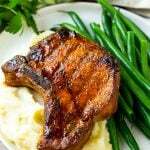 This recipe works best with thick cut pork chops; look for pork chops that are at least 1 1/2 inches thick. 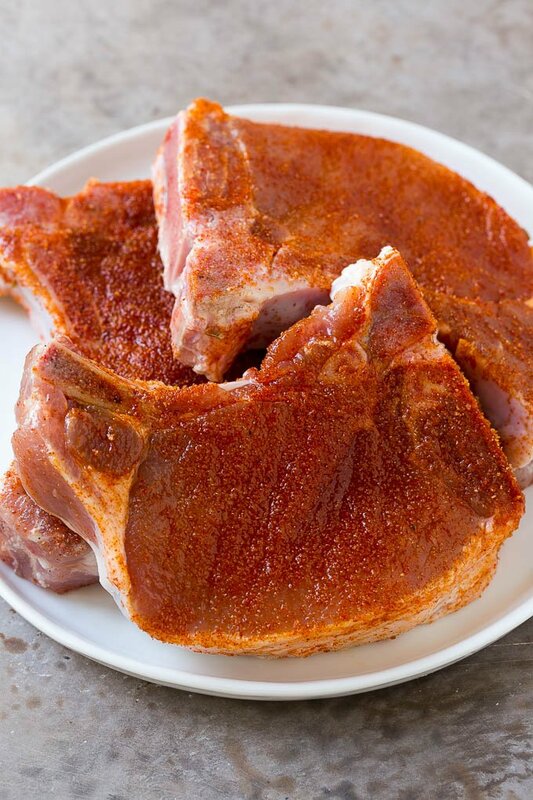 If you opt for thinner pork chops, you’ll need to reduce the smoking time so that they don’t overcook. If you don’t want to make your own spice rub, you can use your favorite store bought spice mix. I sear the pork chops first to add extra flavor and a little caramelization. You can sear your chops on a grill, in a grill pan, or in a skillet. If you’re pressed for time, you can even skip this step although I think it’s worth it. Bone-in pork chops work best for this recipe. I wouldn’t recommend using boneless chops. How long does it take to smoke pork chops? It takes anywhere from 45 minutes to an hour to smoke pork chops, depending on the thickness of your chops. Be sure not to let your meat sear for too long before you put it in the smoker, otherwise it will be mostly cooked through before it even absorbs any of that great smoky flavor! Which wood is best for smoking pork? I like to use apple wood to smoke these pork chops, as it imparts a mild and slightly sweet flavor that doesn’t overpower the meat. Other great options include cherry wood, hickory, maple, or pecan wood. I like to cook my smoked pork chops until they’re just slightly pink in the middle, I find that the meat is perfectly juicy and tender this way. You’ll want to use a probe thermometer to keep track of the internal temperature of the pork while it’s cooking. When the thermometer reaches 145 degrees F, your pork is ready. What goes with smoked pork chops? 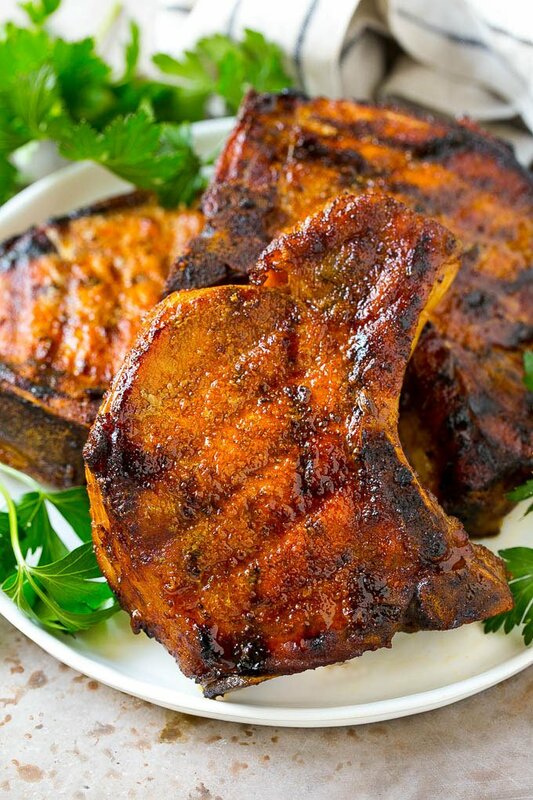 Once you try these smoked pork chops, you’ll never want to use any other cooking method again! Even my kids loved this one, it’s been on our permanent rotation for many months. These smoked pork chops are thick, bone-in chops coated in homemade BBQ spice rub and smoked at low temperature until tender and juicy. An easy and unique dinner option that's packed with flavor! Place the pork chops in the bowl, making sure that they're completely submerged. You can add more water if needed. Preheat an electric smoker to 250 degrees F. Load apple wood chips into the smoker. Drizzle the olive oil over the pork chops, then rub the BBQ spice onto both sides. 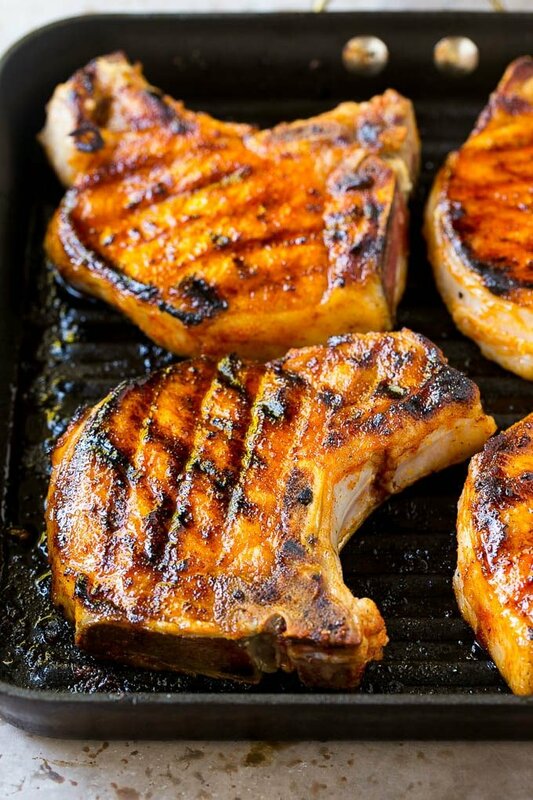 Place the pork chops on the grill or grill pan and cook for 2-3 minutes per side or until just slightly charred. Place the pork in the smoker and cook for 45-60 minutes or until a thermometer inserted into the thickest part of the pork chop registers 145 degrees F.
Let the pork chops rest for at least 5 minutes, then serve. This is inspiring me to make pork chops for dinner! Haven’t had them in awhile and these look delicious! This recipe is absolutely mouth watering! Great recipe for an Easter dinner! Such a yummy recipe! 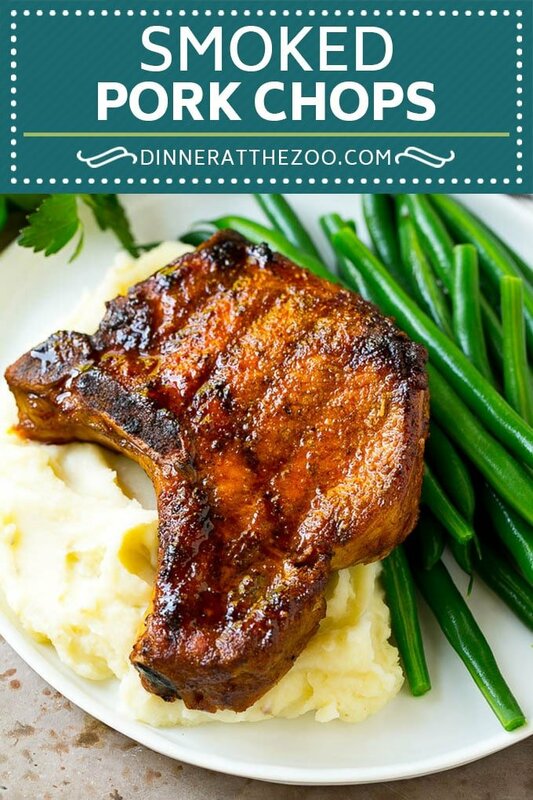 We love pork chops and have them at least once a week. These smoked porkchops turned out incredible! My whole family was raving over the flavor! 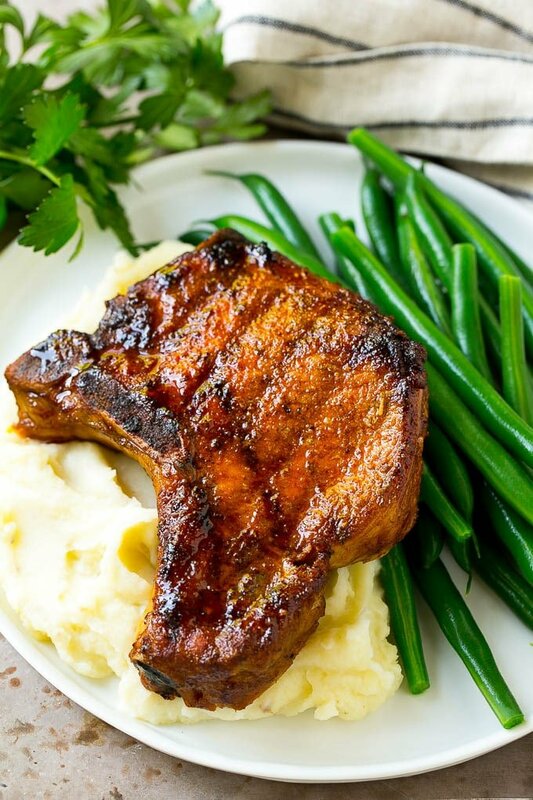 These pork chops looks so juicy & crispy!! The way I like them! Thanks! These look and sound really tasty! I love the idea of being able to enjoy these at home! I am drooling over these pork chops. Perfect for our Sunday dinner! These are so juicy and so delicious! I love how easy they are in the smoky flavor! Love the smokey flavor! Absolutely delicious! Best pork chops ever! I will be making them again soon! These are the BEST porkchops!!! My family loved them! Ahhh yes! So super excited to try these smoked pork chops for dinner this week! Thank you!